Game dealers, restauranteurs, hotels and public houses are being advised to check that they are not buying illegally-killed game. 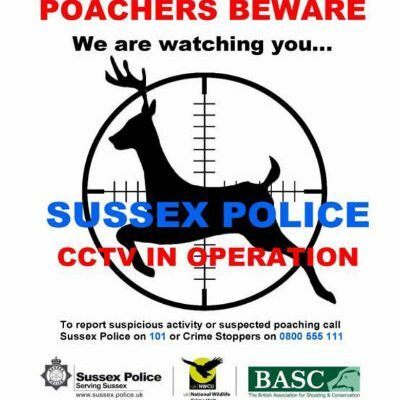 The warning is being made by Sussex Police as autumn heralds a potential seasonal rise in poaching across the county, especially for deer, both shot and coursed and hares, again coursed illegally by poachers with dogs. The force’s Wildlife Crime Officer PCSO Daryl Holter said: “The cosy, traditional image of a local countryman taking ‘one for the pot’ is far removed from the gruesome reality of modern day poaching which can be carried out on an all but commercial basis, often by gangs travelling into the countryside from towns and cities, sometimes from quite a distance. To prevent purchasing illegal meat, people are advised not to buy from people who they do not know, report suspicious gatherings in car parks around vans or 4x4s and dealers in game should show legal documentation for the sale of meat. Daryl said; “Commercial poaching is a serious problem on various levels. It is not a faceless crime. There is a real risk to public health as meat is introduced illegally into the system and in the case of deer poaching, the animals are shot at night using high-powered weapons with an obvious risk to public safety. “There is also concern for deer not being killed in a clinical and professional manner as many are shot with weapons not suitable for the size of the animal. Those not shot cleanly can often escape into the undergrowth to die a cruel lingering and painful death. “I would urge anyone to contact police with any information that would help in catching poachers, especially if they have been offered meat from sources other than bona fide dealers. If you suspect illegal poaching is taking place, please report online or call 101 – but if it’s happening there and then dial 999 immediately. Alternatively, you can call the independent charity Crimestoppers anonymously on 0800 555 111.